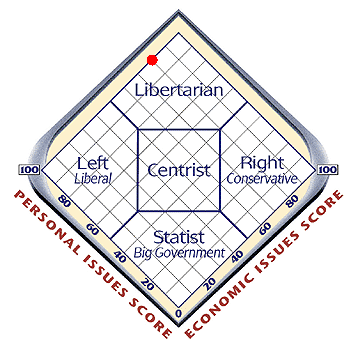 As recommended (but not linked) by Mark Wadsworth in the comments to DK's go at the Political Compass, we have the "Advocates for Self-Government" test. Update: Wow, this post has actually got more hits than Hello Girly - the nightmare may nearly be over. Ta for link to mine, but could you link to the test? I didn't link to it because I couldn't find it on the spur. Thanks, that's the one I meant.